A guide to some of the top Luxury Pattaya Hotels and Resorts with superb facilities equal to the very best in the world. I have not had the opportunity to stay in as many of them as I would have liked, but I am working on it. Perhaps I too, will be able to stay over at any one of them soon and I cannot wait. I shall invite you to join me as we uncover many of these truly exquisite temporary homes of ours. Sheraton Pattaya Resort is located in the secluded but picturesque Phra Tamnak headlands looking directly out to Ko Larn (Coral Island) and the calm waters of its own beach. 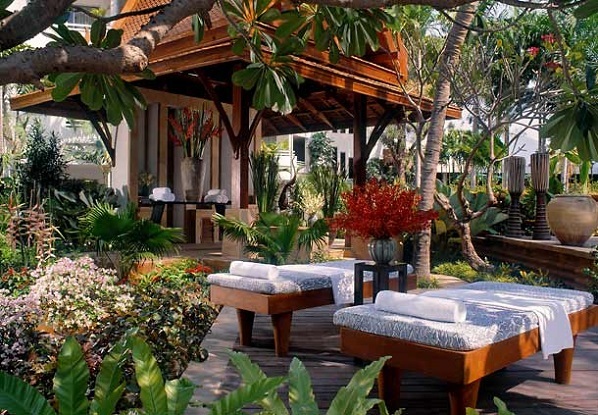 This resort has a blend of traditional Thai and contemporary design in all 156 spacious guest rooms. All the rooms have balconies overlooking stunning sea views and lush gardens. 40 guest rooms have features such as bathtubs for two and outdoor pavilions. Why not secure one of two exquisite villas where you can enjoy your own private plunge pool. Whether it's for business or pleasure, escape to the perfect getaway in an idyllic setting. Dusit Thani Resort is located on a secluded stretch of beach at the northern tip of Pattaya Bay. This hotel offers a whole host of top class services including luxurious spacious suites all with private balconies affording stunning beach views. Facilities here include the Dusit Club Room and the Dusit Grand Room which allows you to mix a little business with pleasure where up to 3,000 guests can be accommodated for seminars or conventions. Why not enjoy a relaxing pre-dinner cocktail at the Lagoon swim-up bar or the Chaba bar before dining at Pattaya's finest Chinese restaurant or award-winning Italian restaurant. Hard Rock Hotel is a great family hotel overlooking the eastern shores of the Gulf of Thailand. It's the perfect location for fun in the sun. This hotel has 320 themed guest rooms and luxury suites, designed and decorated in a vibrant pop style with music memorabilia typical of all Hard Rock outlets. There are six restaurants and bars where you can dine on Thai, Chinese, Japanese, Californian and Italian cuisine. Numerous features include a 2,000 square meter free-form swimming pool with private Cabanas, a Hard Rock Spa and Fitness Center, a Hard Rock Shop and much more other leisure activities. Marriott Resort and Spa (formerly known as Royal Garden Resort) is a great hotel located on Pattaya Beach Road. The resort is a tropical oasis right in the heart of the action. The 293 rooms are set amidst 6 hectares or 14 acres of lush landscaped gardens and only a stone's throw away from the beach. An excellent location for leisurely shopping, fine dining and the exotic nightlife scene. Woodlands Resort is a beautiful resort located at the Northern end of Pattaya's majestically curving bay. This small and charming family-owned 4-star luxury oasis of comfort is set amid peaceful tropical gardens and two stunning pools. All 135 rooms are set in a 2 or 3 tier complex designed in a tastefully modern style with your absolute comfort in mind. There is various top class and spacious room styles to choose from. It's one of the best value Pattaya hotels. Royal Orchid Resort is located on Pattaya's beautiful northern coastline and is the ultimate idyllic family getaway. The 95 luxurious rooms and suites are set around beautiful tropical landscaped gardens with the beachfront only 120 meters away. This is one of the nicest resorts blending luxury and comfort with convenience. Many of the amenities are located very near Pattaya Beach Road only a short distance away. Here you will be able to treat yourself to lots of yummy restaurants, loads of shopping and lots of vibrant entertainment. Avalon Beach Resort is a luxurious hotel set on the pristine Dongtan Beach in Jomtien Bay. This comfortable beach resort is an oasis for lazy blissful days and calm balmy nights. Pamper yourself in any one of the 112 square metre executive suites all with excellent views of the ocean. This has to be one of best Pattaya hotels for the whole family as there are lots of local entertainment and leisure activities to suit all ages and preferences. There's easy access to the coast of Pattaya, only a short distance away. Garden Cliff Resort and Spa is a modern Thai style luxury resort located in a quiet residential area between Pattaya Bay and Jomtien Bay with direct access to a private beach. The resort offers 249 rooms spread over 2 low-rise residences and features a huge swimming pool including a waterfall. There are 3 restaurants, 2 bars, a fitness centre and a health spa to while away your leisure time. The Sanctuary of Truth, made entirely out of teak is within easy walking distance from the resort and a popular tourist attraction not to be missed. The main entertainment and shopping area is only minutes away by car. Royal Cliff Resort lies between Pattaya Bay and Jomtien Bay on a 64-acre lush tropical private estate overlooking the turquoise waters of the Gulf of Siam. This award-winning resort offers a choice of four 5-Star settings each with its own distinct style and ambience. One is cheerful and vibrant, another secluded and tranquil, a third is refined and elegant and the last is exclusive and luxurious. The Royal Cliff Grand Spa and the Royal Wing Spa are two of the resort's most luxurious treatment centres where you can relax in true Thai hospitality. Dor Shada Resort is a fabulous resort located on Jomtien Beach in Pattaya. It was designed and built in a modern contemporary Thai style allowing you the most magnificent panoramic beach views. There are 172 beautifully appointed rooms and 16 luxurious villas to ensure your stay here is a joyous occasion. Facilities include a stunning pool with a pool bar, a fitness centre and Jacuzzi. You need not feel left out of the resorts entertainment either as only a short distance away you will find the bustling downtown area.